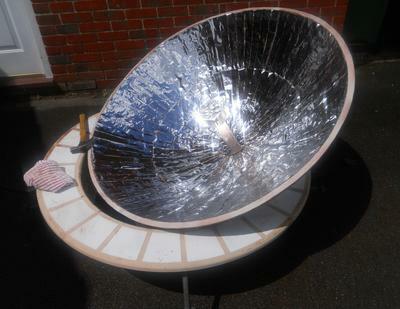 There are relatively few parabolic solar oven stories, perhaps because they are more challenging to make. I built one as an exploration of solar cooking and was pleasantly suprised. I live in England, which is certainly not the best place for a solar oven, due to usual lack of sun, which promted me to make it quite large. I built it from scratch into a parabolic shape using a plywood sheet(the design was quite complex)and used Mylar for the mirror (which was cheap although not an efficient choice). It took a while to build, but in the end,it ended up being light and easy to point in the right direction. It heats up very quickly and I use it for cooking some small food items, for example eggs which fully cook in 10 minutes in good conditions. 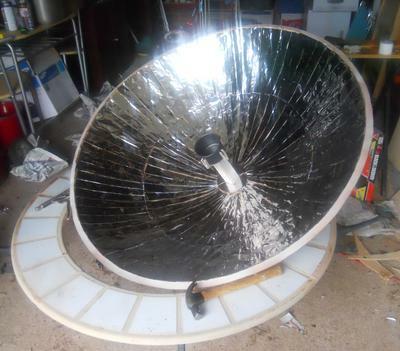 Greetings Adam, and thank you very much for submitting this great description of your very own homemade solar parabolic cooker, it looks really nice, and it sounds like you have been able to use it very effectively and successfully. This should be a great inspiration to others by giving them a model to follow after. If you are willing, and able, to give us a little more detail on the construction process we would love to "spotlight" your parabolic on a page on our website, this way others could follow your instruction to create the same for themselves.